Rising amount of production stages, involved actors and regional areas in food supply chains often increases the time taken for foodstuffs from farm to fork. However, the temporal expansion of food chains is not merely a quantitative one. More significant for industrial food supply is the increasing need for flexibility of time and temporal coordination of practices. Packaging as a conserver of freshness allows the food supply to blast natural constraints like regional seasonality of crops. It enables a spatial and temporal uncoupling of socio-technical systems of food supply from natural ecosystems. From this point of view it is not surprising that cans were used for the first time in the early 19th century by soliders who were exposed to unclear situations of supply. In the globalized modernity the demand for consumer independence from local production got fueled by specialization, individualization and division of work. Complex producer-supplier networks require ongoing temporal coordination between different process stages. Coordination of supply and demand between the different stages in the chain – e.g. farmers, processors, wholesalers, retailers, consumers – entails the need to ensure the fast availability of wants but also the flexibility to the retaining of spillovers. Under such conditions, practices like wrapping a cucumber in plastic foil to expand the storage life for a few days are a logical consequence. Supplementary, packaging plays an important role in the growing flexibility and fragmentation of everyday consumption. in combination with storage technologies like freezing or preparation devices such as the microwave it is part of complex socio-technical networks which allow consumers to abstain from rigid planning of food consumption. I will now discuss results of investigations on cooling chains in food supply (Garnett and Jackson 2007) and home-use of freezers (Hand and Shove 2007) to amplify the temporal diversification of food supply practices. 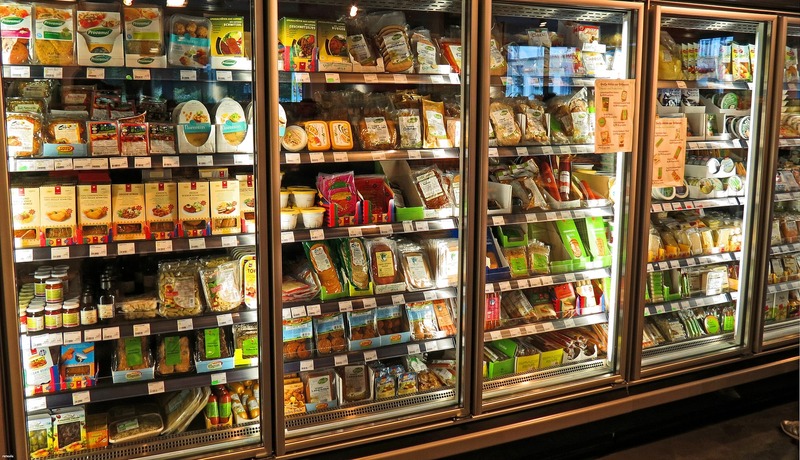 As refrigerating is often dependent on the use of specific packaging and many of the arguments for cooling technologies apply similarly to the use of packaging (namely extending durability) it provides a perfect example. Nearly every product someone can find in supermarket fridges is packed – mostly in some form of plastic. The dissemination of cooling technologies was strongly correlating to the spread of plastic packages. Nowadays temperature control is common feature of almost every stage in the supply chain. Garnett and Jackson (2007) show how interactions between refrigeration technologies, packaging, transport, food product innovations and marketing have helped creating cultural norms and practices which are now highly energy dependent. While until the 70s food purchases were usually happening very frequently, these storing technologies created a shift to weekly and – mostly car based – shopping trips. Over the years cooling and freezing food became a normal part of household practices. Hand and Shove (2007) illustrate how freezers act as instruments of domestic organization by helping household members in coordination and timing of daily schedules. Deep-frozen, cooled or prepacked foods facilitate rapid forms of food preparation and make it possible for consumers to separate processes of purchasing, cooking and eating. Thereby they enable the compromise between job affordances and proper household care. Importantly, coordinating demand and supply between different actors does not only require temporal and spatial coordination of product flows but also communication and exchange of information, knowledge and meanings between certain actors in the network. Food chains which need continuous cooling require reliable exchange practices between certain product stages. Next week I will highlight the role of packaging in these practices of communication and interpersonal exchange. Garnett, Tara/Tim Jackson (2007): Frost bitten: an exploration of refrigeration dependence in the UK food chain and its implications for climate policy. Paper Presented to the 11th European Round Table on Sustainable Consumption and Production, Basel, Switzerland, June 2007. Basel, Switzerland. Hand, M./E. Shove (2007): Condensing Practices. Ways of living with a freezer. In: Journal of Consumer Culture 7, 1, 79–104.